The increasing number of hearing impairment coupled with rising cost of hearing aids are expected to drive the hearing amplifiers market over the forecast period. A majority of the consumers turn to hearing amplifiers or personal sound amplification products (PSAPs) as they are considered cheap alternatives to hearing aids. A new generation of amplifiers that utilize the latest wireless technologies are now offering promising alternatives to people with hearing loss and the market is expected to gain popularity among the hearing impaired population due to the increasing cost of hearing aids. Hearing amplifiers or PSAPs, designed to amplify sounds in any recreational environment are exempt from the Food and Drug Administration and can be sold directly to consumers as electronic devices without the requirement of a physician prescription. The number of hearing loss cases in the U.S. has doubled in 30 years. According to an independent researcher approximately, 28.6 million Americans suffered from an auditory disorder in 2000. Major driving factors for the growth of hearing amplifiers are the increasing prevalence of hearing impairment in old and young population, increasing purchasing capacity and rising investment in R&D. Innovation and new product development play an integral role in ensuring market sustainability. For instance, CS10 manufactured by Sound World Solutions is integrated with Bluetooth and iPhone and is designed to amplify sound for non-hearing impaired consumers via its customization app. It is to provide users with an enhanced listening experience while using the device during business meetings, phone calls, family gatherings and watching movies. Key products in the hearing amplifiers market include on the ear and in the ear. On the ear devices were the leading product segment of the hearing amplifiers market. On the ear amplifiers are more popular due to high connectivity, comfort, highly efficient, easy to use and these attributes are expected to drive segment growth. In the ear amplifiers on the other hand, is expected to witness expedited growth over the forecast period. Growing demand for aesthetically appealing disability-related products is expected to serve the segment as a high impact rendering driver. 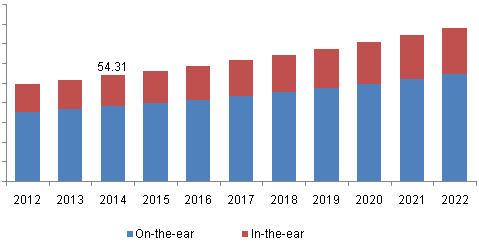 Europe accounted for the largest share of the hearing amplifiers market at over 40.0% in 2014. The increasing prevalence of deafness and the introduction of technological advancements and the subsequent growth in awareness levels are some key factors expected to contribute towards the rising demand for hearing devices in Europe. In addition, the growth of the audiology devices market in this region also depends on the reimbursement policies undertaken by each European nation. As per the British MRC Institute of Hearing Research study, more than 900 million people in the world will suffer from hearing loss by 2025. Out of this population, around 90 million patients will be from Europe. Anteunis (1999) estimated that up to 20% of adults (52 million Europeans) and 36% of the geriatric population suffer from some level of hearing handicap. Asia-Pacific is expected to witness rapid growth over the forecast period. Increasing prevalence of deafness especially in the geriatric population coupled with improvement in the distribution network of global market players is expected to drive the growth of this regional hearing amplifiers market. Other factors likely to drive the market for audiology devices in Asia-Pacific include increasing disposable income, patient awareness and healthcare expenditure levels of the general population in this region. The introduction of favorable government initiatives is also expected to boost market penetration rates in the region. According to estimates published by the WHO in 2012, the prevalence of disabling hearing loss is high in people over the age of 65 years in the Asia-Pacific, Sub-Saharan Africa, and South-Asian regions. Key players of the hearing amplifiers market include SoundHawk, Resound, Foshan Vohom Technology Co. Ltd., Sound world solution, Shenzhen LA Lighting Company Limited, Austar Hearing Science And Technology (Xiamen) Co., Ltd., Huizhou Jinghao Electronics Co. Ltd. , and Ziphearing. The market is technology driven, and therefore, manufacturers are engaged in rigorous R&D to develop new and technologically advanced amplifiers which cater to the changing needs of the consumers.